Jeff McEachran is the National Brand Manager for Gyeon quartz USA and Owner of Denver Auto Shield in Denver, Colorado. 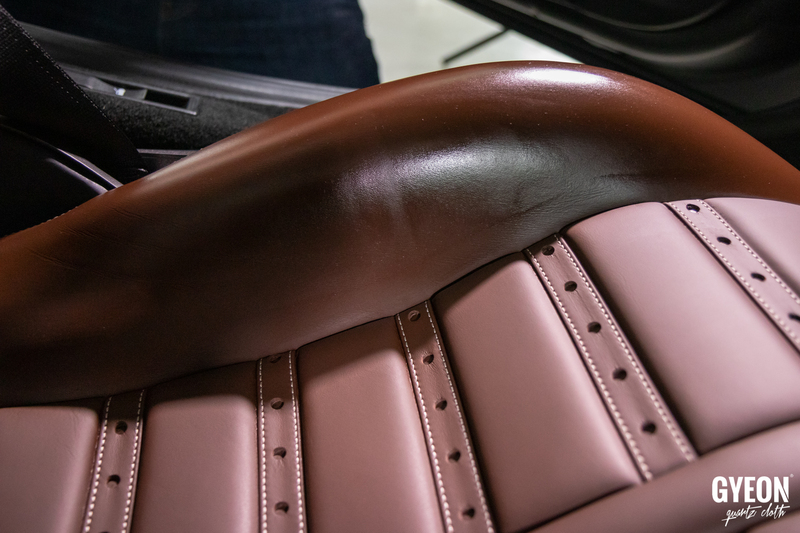 As most of us start to come out of Winter and in to the Spring season, I thought we’d explore a bit of leather protection before the onslaught of tanning oil and sweat hit the seats! 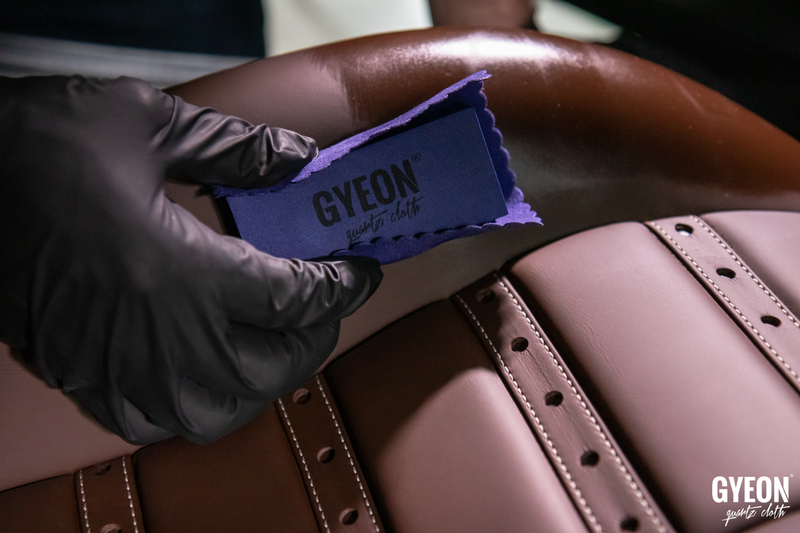 Gyeon quartz produces 2 protective products designed specifically for modern leather and upholstery: Q² LeatherShield and Q² LeatherCoat. Today we will focus on Q² LeatherShield. Q² LeatherShield is an advanced, SiO₂ based formula, specially developed for all types of modern automotive leather upholstery. It provides protection against dirt, UV rays and the intensity of everyday use. Q² LeatherShield is very simple to apply, requiring only one layer. It’s designed for and been tested on all modern types of leather, providing great protection and no change of feel or color, leaving a fully matte finish. Q² LeatherShield does not stiffen the leather or make it more slippery, maintaining the original feel. The application method is a touch different than most, so I wanted to go over it step by step on this very well spec’d Ferrari 488. 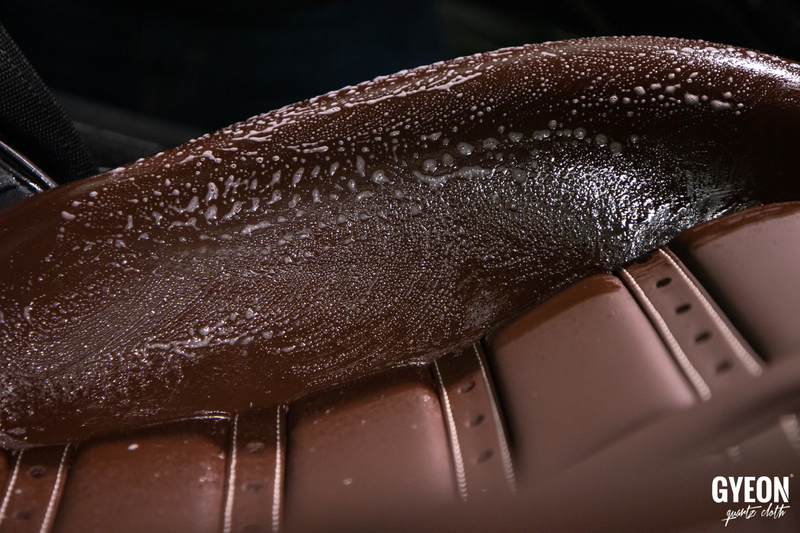 First, we need to clean the leather surface intently. Here we are using Gyeon quartz Q²M LeatherCleaner and the Q²M LeatherBrush. 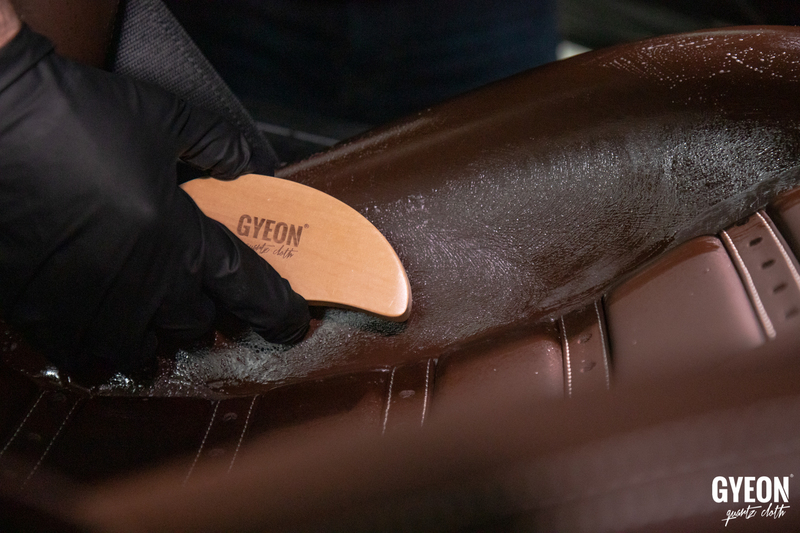 Once we have a good lather built up, suspending the dirt and contaminant, we use straight line wiping motions with a highly absorbent microfiber (here using Gyeon quartz Q²M PolishWipe) to pick up the suspension and remove the contaminant. This removal process is important so that we are not smearing around the contaminant and working it back into the leather. 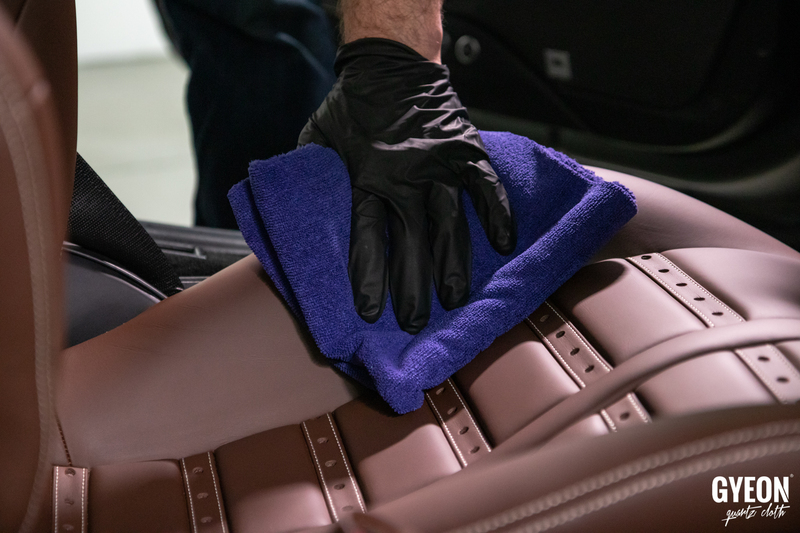 Once the leather is clean and dry, it is time to apply Q² LeatherShield. Apply a moderate amount of product to the included suede and foam applicator. 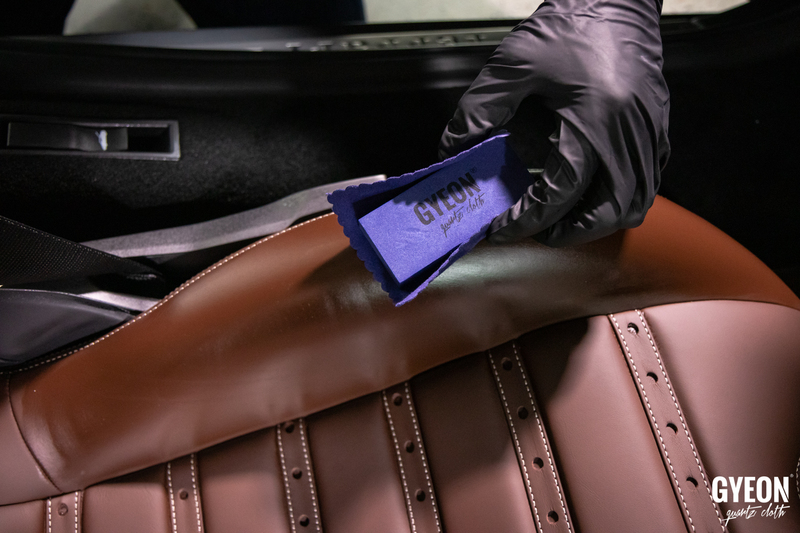 You can also use the new Microfiber Applicators from Gyeon quartz. Whatever fits your personal preference. In terms of the application area, I like to choose a section of the seat with a clear start and stop points so I can easily control the application area. Here I started with the outer bolster. Apply Q² LeatherShield in an even and overlapping motion to get adequate coverage. The applied section will look very “wet”. 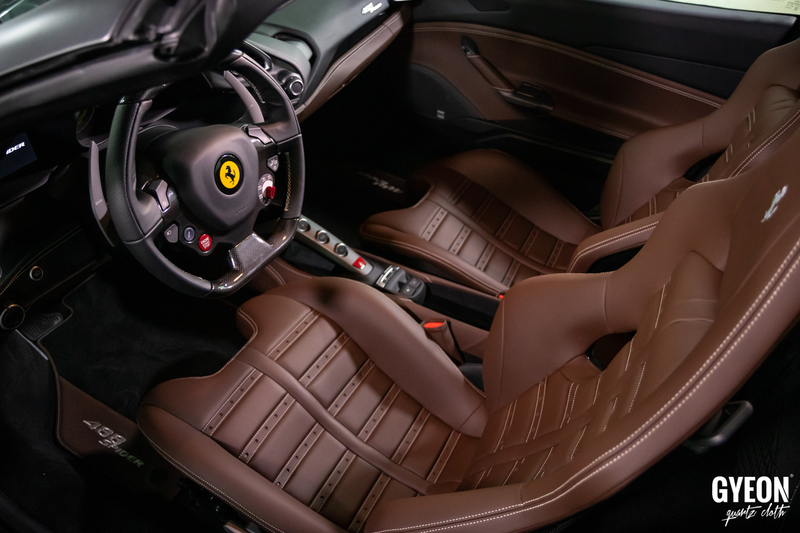 Your natural instinct will be to wipe off the excess quickly because getting a nice even finish is always a little scary when coating leather. Fight your instinct!!! Q² LeatherShield wants to absorb in to the pores of the leather. It will dry to a nice even finish over the next 5-10 minutes. If during the first few minutes you feel like you have a bit of uneven coverage, where a certain area is looking like it is not drying at the same rate as another, simply take the same application suede WITHOUT ADDING ANY MORE PRODUCT and “level” out the excess material. 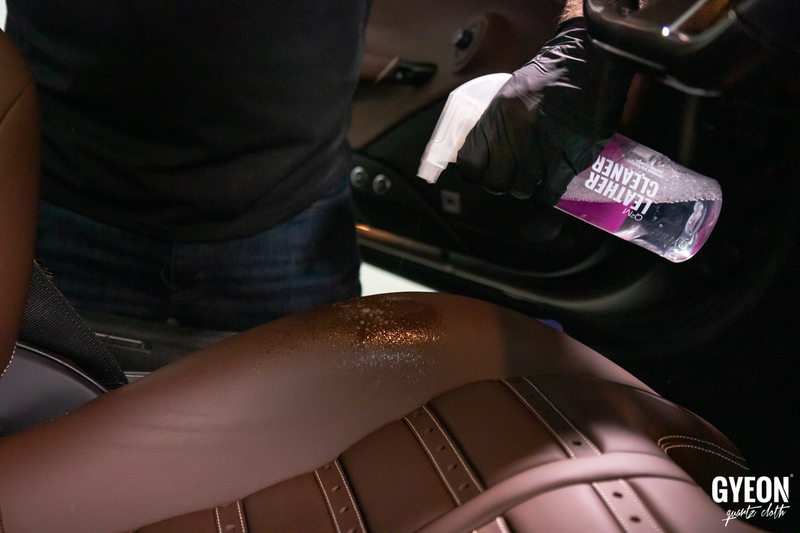 Once you have the finish “even” again, let Q² LeatherShield dry in to the surface. If you still have an uneven finish after 10 – 15 minutes, you can wipe with a microfiber towel to pick up the excess product. To be honest, I do this even though I know I don’t need to in order to make my brain feel better. 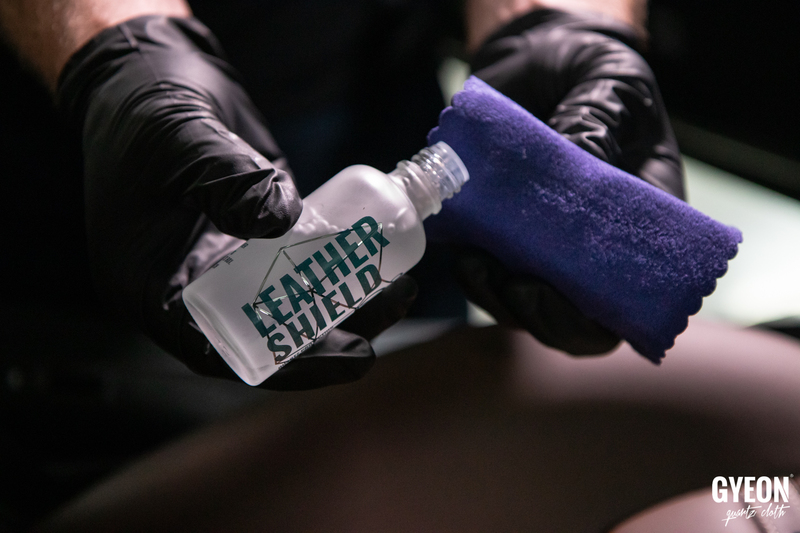 Q² LeatherShield will dry to a gorgeous, matte, healthy finish that does not feel greasy or oily. It is designed to last roughly a year, which is of course based on use. It can be cleaned with Q²M LeatherCleaner without degrading the coating itself. It can also be topped up with Q² LeatherCoat if desired. I just applied a different leather coating (IGL) to my seats. I started off trying to use the block method for application and quickly found I could not reach all of the dips and nooks in my leather. I decided to forgo the block and just apply with the microfiber square and my rubber glove. Using this method I was able to hit all of the areas that could not be hit with the block. 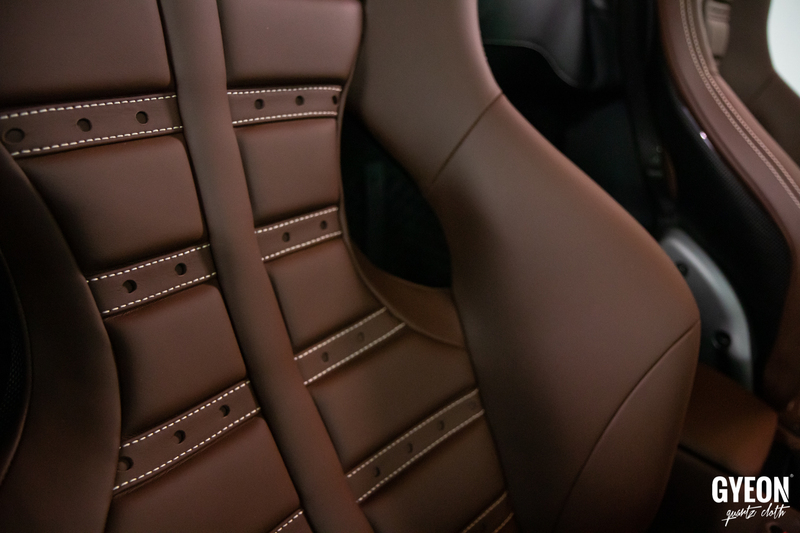 Unlike the vehicle exterior, where it is mostly flat, seats have ridges and seams that you want to cover completely. Try the block method, but if you find you are having difficulty covering all areas try my way and I think you might find it easier. 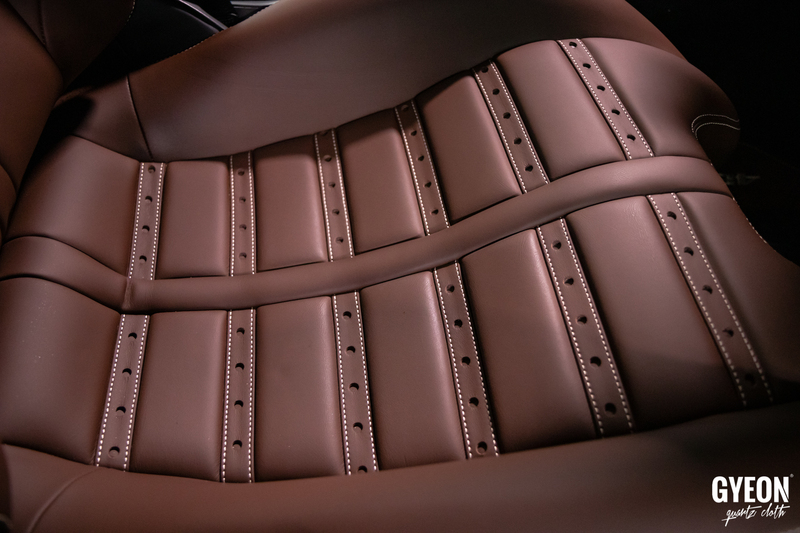 When you say it “wants to soak into the pores of the leather”, how does that apply to coated leather that is common in most modern vehicles? Q² LeatherShield is designed for modern interior surfaces. It means the product wants to be absorbed in to the material where it can and dry naturally, not be immediately wiped off. Nice write up Jeff. Leather Shield is a great product. It has done well for me and does last a long time during daily driving. Resisting the urge to wipe off the product is hard to do just as you said. Thank you Mike! Very glad it is working well for you.